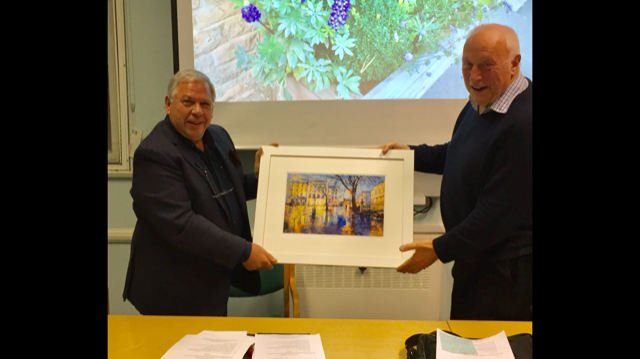 At the Annual German Meeting of the Cheltenham Twinning Association on 23 November 2017, Cllr Garth Barnes stepped down as Chairman of Twinning after 15 years. He was presented with a picture as a token of appreciation for his devoted hard work and support over so many years. Garth has been involved with twinning for over 40 years and has also received the Göttingen Medal of Honour for his commitment and dedication towards developing the very strong link with our German twin town. He has been an excellent Ambassador for Cheltenham in all of our twin towns and everyone involved with twinning thanks him very much for all that he has done. Garth will remain on the committee and Cllr Diggory Seacome was elected as the new chairman. This entry was posted in Annecy News, Cheltenham Pennsylvania News, Cheltenham UK News, Göttingen News, Sochi News, Stampersgat News. Bookmark the permalink.